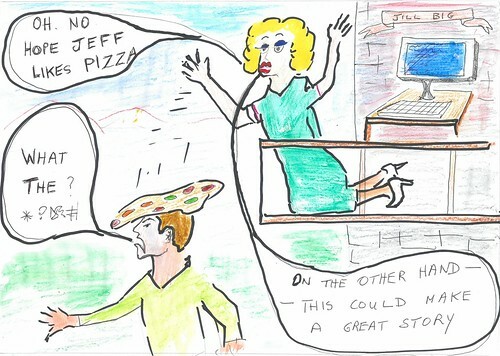 One summer evening, Big Gill was eating frozen pizza on her balcony. She was leaning on the railings. She saw her Mum below and panicked and dropped the pizza. It fell all the way down and landed on Jeff’s face. He was lying on a sun-bed. Jeff is Gill’s best friend. He works for Deliveroo. Gill ran downstairs to apologise but tripped. Meanwhile Jeff got such a fright he slipped on the tomato sauce and fell into the pool. Unfortunately the pool was full of jellyfish (his pets) so poor Jeff got stung. ‘Oops sorry Jeff’ said Gill when she arrived at the side of the pool. ‘What happened?’ asked Jeff as he climbed out of the pool. ‘I saw everything! !’ Gill’s Mum said. ‘Hold on, this is great!! I can work this into my next book, The Adventures of Panda.’ Gill said as she rubbed her sore wrist.